I was struggling with my Winter Shawl project. I had purchased an Addi Turbo needle for it but the yarn and needle were not happy partners. The needle tips were both too blunt and too slippery and when those facts were coupled with an over-long cable with a great determination to kink… I decided something with more cling was needed. 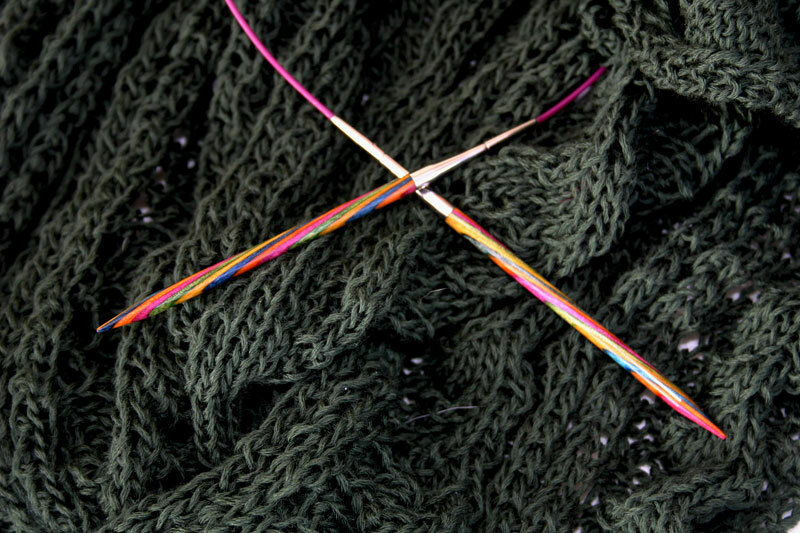 I briefly considered a set of cheap bamboo needles but was worried about how curly the cables would be, and length was an issue considering the fact that I am making a large DK shawl. I got to wondering about the Symfonies and asked around to see how others had got on with them. The answer came back loud and clear – “You won’t regret it.” Nor have I. 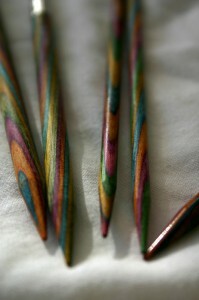 Reader beware, I am going to wax lyrical about these wonderful needles! 3 sets of wooden interchangeable tips in sizes 4mm, 5mm and 6mm. The starter set does not contain any cable connectors. For those unfamiliar with interchangeable circulars – they come in sets of paired points with screw ends, usually female. The screw end has a tiny hole through it. Included are cables of varying lengths. These too have screw ends, usually male. The cables and tips screw together to form a firm join when the cable key is used to tighten the joint. The cable key slips into the aforementioned tiny hole and is used to apply leverage ((The hole has a useful side function when adding lifelines to a project)) . Warning: Failure to use the key may result in some terrifying knitting moments – the points can come apart from the cable, leaving your stitches cascading onto the floor. Parallel knitters please note: Sets usually also provide some end caps – these screw onto the cables in place of the needle tips and are massively useful when you need to steal the tips for another project. Try that little trick on a fixed set! Or try making a stitch holder out of a fixed cicular? With a short interchangeable cable and two end caps, you have a wonderfully flexible stitch holder. A full set has the advantage of offering every needle size imaginable – apart from teeny ones. My assumption is that the smallest diameter needles are too small to allow the cost-effective manufacture of the screw end fixing. But it’s a bit of a begger for the committed scary-lace knitter to pay for a full set and then find a couple of essential sizes gone missing. The same is true for Magic Loop sock-knitting fiends. Imagine a “full set” of needles that only begins at a big fat 3.5mm! Well, that is true of the Symfonie set – nothing in the 2mm to 3.25 mm size range that I frequently use, and a number of large points that I would be unlikely to use, if ever. Some mental arithmetic went on. OK – the full set is “only” Â£45 – and that is pretty cheap when compared to endless purchases ofÂ fixed circular needles in all the varying configurations that one ultimately needs, but it is a lot in one go and especially when I am irritated by the absence of one end of my knitting spectrum. 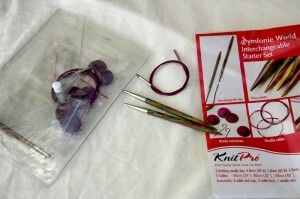 Luckily, KnitPro offer two starter kits, with 3 pairs of tips in each. The jumbo ones are no use to me, but 4-6mm falls into my most-used range of needle sizes. With three cables to choose from, and join together, I felt the purchase to be well worth my seventeen pounds. Can you tell that it was a shock and a disappointment to find no connectors included in my set? Yup. But let us move on to happier thoughts. We’ll start with the business end, the needle tips. The Symfonie range features wooden tips. These are pleasingly multi-coloured, and said to be manufactured from laminated birch wood. 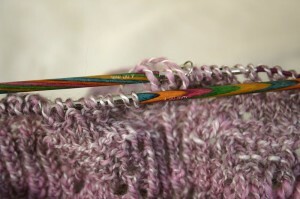 The sharp points have a good length of taper – “sharp” in knitting is a relative term and does not actually equate to “you’ll do yourself a nasty injury with those.” The surface finish is slick and glossy, satin-smooth; the join between the wood point and the metal screw end is practically indiscernible ((I know this, having closed my eyes and run forefinger and thumb along the needle barrel)) The connection between the screw components of cable and needle tip is also very smooth, when properly tightened. The length of tips in this set is a tad over 11.5cms from needle tip to the end of the screw casing. The cables are also pleasing. They are distinctively purple. Easy to spot when dropped on the Axminster – except on my purple rug, where they become camouflaged very well indeed. The great surprise and delight is that the cables have virtually no memory. Unlike the Addis, which make claims that they patently do not live up to, these cables are reliably pliable. They do curve when taken from the packet, but they show no kink and no self-will whatsoever. I am smitten. Like the needle joints, the connection between cable and screw end is also well-made. The screw thread itself is sensibly long, a full 5mm. If I had a quibble with this set, other than the lack of cable-to-cable connectors, it would be with the keys – which are basic in the extreme; a bent wire that is fiddly to manouevure and uncomfortable to hold. The keys that came with my full set of cheap interchangeables are far easier to use and that set also came with a flexible, textured rubber disc, designed to assist grip on the little critters. While I couldn’t be in the least complimentary about the cables or the points in that set, I shall be shifting the key elements into my new Symfonie case. The screw-on caps, as already mentioned, allow for the creation of stitch holders and the suspension of stitches. They can also be used to terminate the needles if they are to be used as “short straights” – attach a short cable to each point and cap it off with a screw cap at the other end of the cable. The whole set comes in a not-very-aesthetically-pleasing but nonetheless functional clear plastic wallet case. The case has individual pockets for each pair of tips and closes with a popper fastener. So that’s what you get for your money: do they perform? They perform, and then some. The points slip effortlessly into the stitches, the needles just glide across each other, the stitches ease gently along the needles and on and off the cable without the slightest hitch. I have been using the longest cable with the 5mm tips on my Winter Shawl and productivity has more than doubled, with a marked decrease in discomfort in my hands and wrists. The tips provided sufficient adhesion for the soft merino yarn, without losing the stitches as the Addi Turbos did, but were still slippery enough to allow for some fast knitting. 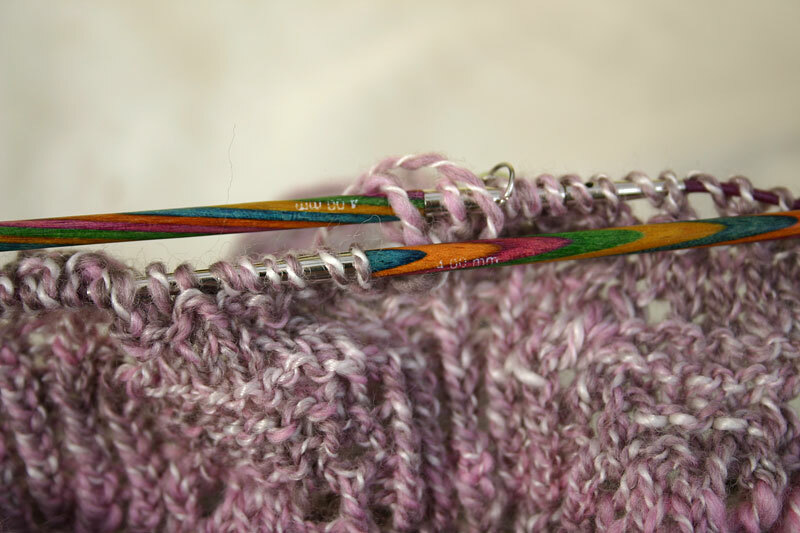 The stitches move along the cable and onto the needle with no obvious restriction – I could just as easily have been using straight needles. Equal success met the experimentation with the 4mm tips and some of my handspun – I rattled off the Yarn Harlot’s cowl pattern, Pretty Thing, with speed, ease, and comfort. In summary, after years of loathing circular needles, I am now something of a convert. Although circulars will never be my preference over 15″ straights, I do now see the point of their existence from the knitter’s perspective. ((The manufacturer’s persepective was always clear – make things such that the knitter needs to buy dozens of different needles and we’ll make shed loads of profit)). The difference for me is the hiccup-free knitting now made possible by well-tempered cables and smooth joints, plus the removal of the need for duplicate needle sizes in varying lengths. 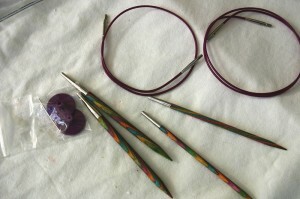 Interchangeable needles are a cost-effective solution to circular knitting, especially in the KnitPro scenario where a basic set can be beefed up by small additions without the need to buy an expensive full set containing items one will never need. On the matter of additions: I am so converted to these needles that I have already sent for some new tips (8mm) and a longer cable (I’m planning a chunky Mobius scarf) plus those missing barrel connectors for joining cable lengths together. KnitPro also make interchangeables with metal tips – the Nova range. These are like my DPN set, I think. A recent addition to the KnitPro range are the Spectra acrylic needles, and these too are available in interchangeables. One thing that I am not clear about, but I do hope is true, is whether this is a single system. If I can add odd pairs of super-slick nickel points or lightweight acrylic tips at will, when specific projects merit them, to my basic kit – then the KnitPro needles really do start to earn their keep and to show remarkable value for money. I am a very happy consumer. KnitPro have solved more than one problem for me, at a fair price, and with a very good quality product. The lack of small sizes disappoints me, but I understand what I think must be technical difficulties with their manufacture and I will certainly make up the shortfall with fixed circulars from the Symfonie range, as and when I need them – because these are truly wonderful workhorse needles and I expect them to cope admirably with whatever I choose to throw at them. Oi’ll give ’em five woolgathered sheep out of five. KnitPro are manufactured in Europe by Indeutsch International. Next Post Winter Shawl Progress: 13/10 You know those hlls that look like they are going down when they are actually going up? I bought the wooden complete set as a newbie knitter, I’ve since added some metal tips in the smaller sizes, and now have practically every size needle I would ever want to use. 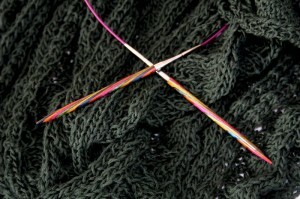 Swatching is so easy, I just keep the swatch on the cable and change over the tips. I also have the connector kit and their super long cable from when I knitted hemlock ring, again they’re wonderful. I use the fixed circulars for every size below 3mm, and while I’d love the options of having a cable length, they are still superb needles for the price. I never use my small collection of straight needles now, I knit everything on these. Oh and if you should happen to sit on one of the metal tips you can bend it back in to shape with no problem….. They are extremely pointy, if I knit using my metal tips for a whole day the index finger I use to push my needle knows about it!